Sewell, NJ, USA (March 2018) – Coperion and Coperion K-Tron formally announce exhibition in Booth 1413 at the International Powder & Bulk Solids Conference & Exhibition (April 24-26, 2018), Donald E. Stephens Convention Center, Rosemont, Illinois, USA. The booth will feature feeding, pneumatic conveying and systems engineering solutions for various processing applications in the powder and bulk materials industries. To meet the growing demands of continuous processing in pharmaceutical applications and also to address similar requirements for quick changeover and cleaning in batch applications, Coperion K-Tron introduces the next generation of its highly accurate pharmaceutical loss-in-weight screw feeders. 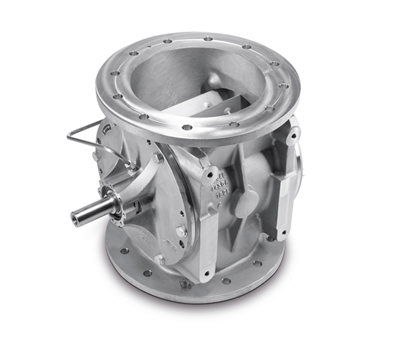 Also debuting for the first time will be a USA-manufactured Coperion ZRD rotary valve from Salina, KS, that will significantly shorten delivery times for bulk solids industry customers. Further exhibits include a simple but clever electronic solution for accurate and reliable pressure compensation for loss-in-weight feeders, as well as several Coperion K-Tron feeders demonstrating the widest range of feeding solutions in the industry. Visitors at the show can also see firsthand a transparent glass pipe system demonstrating various modes of pneumatic conveying and a full line of pneumatic conveying components including rotary and diverter valves, plus a sanitary vacuum conveying receiver. Don’t miss out, it will be well worth a visit to Booth 1413 and see what all Coperion and Coperion K-Tron has to offer and talk to the experts at the show. The new K3-PH feeder design features a modular concept, complete with a drastically reduced overall footprint, thanks to a smaller D4 platform scale incorporating the patented and highly accurate Smart Force Transducer (SFT) weighing technology. The new D4 platform scale features the same state-of-the-art sanitary design of the established Coperion K-Tron D5 scale. Smooth, crevice free surfaces prevent deposit of dust and product residue and enable easy cleaning. At the heart of the new D4 scale, Coperion K-Tron’s patented SFT single wire weighing technology provides a highly accurate weight signal with a resolution of 1:4,000,000 in 80 ms. The advanced electronics include linearization, temperature compensation, and a digital low-pass filter to reduce the effect of plant vibration. The 100% digital design eliminates the need for calibration. The feeder’s modular quick change design allows the easy exchange of feeder types and sizes as well as hoppers or agitators using the same scale & drive for fast adaptation to new processes and formulations while also ensuring easy cleaning and maintenance. The new design is ideal for multi feeder clustering in a variety of continuous processes, including direct compression (CDC), continuous extrusion, wet and dry granulation, and continuous coating, as well as traditional batch processes. The new modular pharmaceutical feeder design includes several innovative modifications, all engineered as a result of in-depth market studies with end users in the pharmaceutical industry. The quick change feeder bowl, agitator and screw combinations which can be quickly decoupled from the feeder drive provide for easy and fast changeover and cleaning of the feeders. By opening two clamps the feeder bowl can be released and replaced by a clean one for running a new product. The three available Coperion K-Tron feeder types QT20, QT35 and QS60, both twin and single screw, can be used with the same scale and drive combination. The redesign of the scale from a heretofore round design to a trapezoid design facilitates an optimized multi feeder arrangement with a much smaller footprint. This is important and useful especially in areas with limited space, where multiple ingredients must be fed into one process inlet. In addition, the feeder bowls and hoppers feature a new improved seal design for ideal product containment. The new modular concept also features a newly developed drive using a servo motor which helps reduce the overall footprint and offers a much larger turndown range, including low feed rates. Multiple gearbox changes as in the past are not required any more. The three available feeder types QT20, QT35 and QS60 are interchangeable, depending on the product to be fed, the required feed rates and the necessary scale resolution as continuous processes often require multiple ingredients to be fed into the process at different rates. For an optimal Wash-in-Place (WIP) result, every unit has an integral 2 degree pitch facilitating maximum drainage during the cleaning process. The new modular K3-PH line concept is designed to provide for a cluster arrangement of 6 or more feeders to meet these complex requirements. The complete line of equipment is engineered to meet the rigid requirements of the pharmaceutical industry, including strict adherence to cGMP guidelines and standards as well as the use of FDA approved materials of construction. The new Coperion K-Tron K3-PH line of pharmaceutical design loss-in-weight feeders includes proven instrumentation, controls and optimized design options for continuous feeding of difficult flowing pharmaceutical excipients and API’s. Depending on the application, the new pharmaceutical feeder line can be outfitted with a variety of ancillary options including the innovative ActiFlow™ bulk solids activator, a material flow aid for feeding difficult flowing materials, as well as Electronic Pressure Compensation (EPC). EPC is a unique instrumentation package which can optimize feeder performance in continuous operations such as blending, extrusion, granulation and coating. The pharmaceutical feeders are available in volumetric and gravimetric, single and twin screw models. In order to significantly shorten delivery times for customers of the Americas market, Coperion K-Tron located in Salina, KS, USA has started the US production of German-designed Coperion rotary valves type ZRD in Salina. Local production of the valves, along with a considerable investment of stocked inventory, will allow Coperion to deliver and repair valves for the Americas market with significantly shorter delivery times. Standard grey cast iron and stainless steel ZRD rotary valves will now be available to customers within 4 to 6 weeks. The Coperion ZRD rotary valve is specially designed for plastics, mineral, chemical and food applications. The valve is engineered for heavy-duty industrial service with pressure differentials up to 21 psi(g) [1.5 bar(g)] and temperatures up to 212°F [100°C]; higher temperature options are available. The ZRD is often used as a discharging and metering valve for conveying products in powder and granular form. An extensive range of sizes is available, with large throughputs ranging from 500 to 400,000 + lb per hour (subject to bulk density and application). The valves have a pressure-surge-proof, (pressure shock) rating of 145 psi(g) [10 bar(g)], and are suitable for isolation according to NFPA standards (for select sizes up to 12 inch). The ZRD comes standard with air purged seals completely mounted with plastic or stainless steel tubing, solenoid and filter regulator with gauge. Standard seal option includes the popular T3 PTFE and quad ring assemblies, which eliminate the need for air purge in most applications. In addition, the ZRD comes with a sealed-for-life outboard bearing arrangement, separated from product, with and without purge gas by way of a dedicated relief opening. Coperion K-Tron P-Series receivers provide a sanitary solution for difficult material conveying applications. The sanitary design features include steep cone angles to ensure excellent discharge and band clamps for quick disassembly. The conveying principle includes vacuum, dilute phase, and dense phase. Conveying rates vary depending on model, product characteristics and conveying distances. Typical materials include tablets, capsules, flakes, free-flowing to poorly flowing powders, and materials requiring gentle conveying. Model on display includes a P10 in mirror finish. A pneumatic conveying demonstration system featuring transparent glass pipe will be a highlight to the booth, which will allow attendees to see firsthand different modes of conveying bulk solid material. The unit will be constructed to allow guests to observe particle flow through this unique and one-of-a-kind system. See for yourself how different conveying methods are especially suitable for premixed materials, materials with high bulk density, materials which are abrasive, friable, or tend to segregate. Coperion K-Tron will present a unique Electronic Pressure Compensation (EPC) system for their high-accuracy loss-in-weight feeders. The main advantages of the new system include improved accuracy and reliability as well as lower initial cost and easier installation compared to traditional mechanical pressure compensation systems. Coperion K-Tron has developed a clever but simple electronic solution for accurate and steady pressure compensation in feeder hoppers and outlets. The modular design incorporates pressure sensors and electronics tailored to interact smoothly with Coperion K-Tron’s KCM feeder control system. Retrofitting options for existing feeders are available. EPC can be installed on a majority of Coperion K-Tron gravimetric feeders in almost any application and all industries. Coperion K-Tron’s new QT20 pharmaceutical feeder with a redesigned trapezoid scale shape and significantly smaller footprint is optimized for multi-feeder clusters around a process inlet. solution for sanitary ingredient handling.